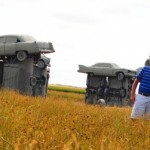 Nebraska is not generally considered a prime tourism destination, but, if they install a few more attractions like Carhenge, it might give Kansas a run for its money. For years, Jim Reinders lived in England studying Stonehenge. In 1987, he would use that experience to shape, proportion and size a magnificent, thirty-eight vintage-vehicle replica that he would call “Carhenge” in honor of his father. The gray installation piece is over 96 feet in diameter and proportionally identical to the original Stonehenge. It’s actually quite amazing to stand in the center and marvel at the enormity of the design. After staring at the artwork and taking a few photos, we walked along the path to other automotive related art including a flower, dinosaur, a representative four (Ford) seasons, time capsule and more. Like the original, Carhenge is quite mystical and open 24-7, 365 days a year. In fact, a few friends suggested that we visit the attraction at night. Though we didn’t have the time to on this trip (as we were heading to Chimney Rock), it’s definitely something we’d suggest.